Looking for a reputable Denver cleaning company? Look no further than Denver Cleaning Group! Built upon 9 years of experience in the commercial and residential cleaning industry, DCG is your trusted partner for any cleaning need. Being a leading Denver cleaning company, we offer comprehensive cleaning services throughout the Denver metro area for houses, townhomes, apartments, etc. We also service a wide variety of commercial properties. In a nutshell, we help keep Denver clean. Order your cleaning service today (link to the order page with the package options) or submit a free online estimate request. FLEXIBILITY: One-time service & recurring services available. QUALITY: Professionally trained staff & Top Quality Guarantee. CONVENIENCE: Schedule your cleaning online, by email, or phone. AFFORDABILITY: Great pricing with terrific quality. Best Value Guarantee. SUPPORT: Total customer support: by phone, online, and in person. SECURITY: Insured and Bonded. All our workers are legal in the US and pass a background check. Warehouse Facilities, and much more. All of our Denver cleaning services are performed by experienced janitorial professionals. 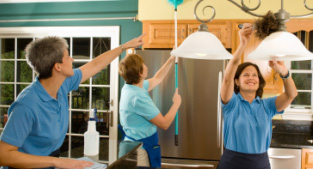 Denver Cleaning Group is bonded and insured for your protection. Call today at 303.319.0596 to receive a free estimate and to learn more about Denver Cleaning Group's great services and affordable rates.